Geneva (AP) — Four teams, including five-time winners Bayern Munich, sealed early places in the Champions League knockout rounds on Tuesday. Barcelona, shockingly, were not among them despite Lionel Messi’s goal giving them a first-half lead at Manchester City. 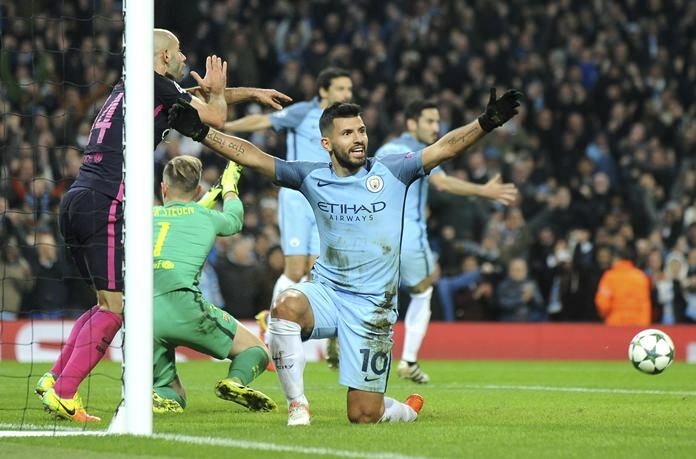 Pep Guardiola’s team turned a memorable game on its head to win 3-1, and end the English side’s run of being outclassed by their coach’s former club in recent years. Bayern and Atletico Madrid both advanced from Group D, Arsenal and Paris Saint-Germain booked their tickets from Group A to the round of 16. Arsenal took an adventurous route in Bulgaria, trailing Ludogorets Razgrad by two early goals before Mesut Ozil’s sublime solo goal in the 88th minute clinched a 3-2 win. Arsenal and PSG are tied on 10 points and each could win the group — and seeded status in the round of 16 draw — with victory when they play in London on Nov. 23. Both needed late goals to secure three points on Tuesday. PSG dominated at Basel but a 2-1 win was only sealed in the 90th by defender Thomas Meunier’s volleyed shot from outside the penalty area into the top right corner of the net. The Swiss side were down to 10 men at the time, following an 84th minute red card for midfielder Geoffroy Serey Die. Basel’s leveler in the 76th was also a stunner. Substitute Luca Zuffi’s dipping shot from 35 meters out deceived goalkeeper Alphonse Areola. PSG had led in the 43rd when Blaise Matuidi diverted Meunier’s shot across the goalmouth with a deft flick off his right heel. Arsenal advanced from their group for a 17th consecutive season under coach Arsene Wenger. Down 2-0 after 15 minutes, the game was soon level through goals by Granit Xhaka and Olivier Giroud. Ozil then perhaps bettered his hat trick in a 6-0 rout of Ludogorets last month. He collected a through ball, lifted it over goalkeeper Milan Borjan, and then glided past two defenders before calmly slotting into an empty net. In a tight group, Napoli and Benfica are on seven points with unbeaten Besiktas on six. Penalties were key to Besiktas and Napoli drawing 1-1 in Istanbul, and Benfica beating visiting Dynamo Kiev 1-0. Besiktas led in the 79th minute when Ricardo Queresma scored from the spot, and Napoli talisman Marek Hamsik’s arching shot from distance leveled three minutes later. There were reports that a Napoli fan was stabbed before the match in an Istanbul metro station after a clash between supporters. Eduardo Salvio put Benfica ahead with a powerfully hit spot-kick in first-half stoppage time, and Dynamo were denied an equalizer when goalkeeper Ederson saved a penalty from Junior Moraes. Manchester City had lost all five Champions League games against Barcelona since 2012 — including a 4-0 mauling at Camp Nou two weeks ago. Messi’s 90th goal in Europe’s top club competition in the 21st minute, finishing a clinical counter-attack, suggested a repeat. However, inspired by Kevin De Bruyne, Guardiola’s team fought back first through Ilkay Gundogan in the 39th. De Bruyne fired in a free kick in the 51st, and then sent a stunning through-ball for the third, slammed in by Gundogan from close range in the 74th. Celtic did City a favor by levelling late in a 1-1 draw at Borussia Moenchengladbach. Moussa Dembele’s penalty in the 76th cancelled out Lars Stindl’s opener in the 32nd. Barcelona lead with nine points, two clear of Man City. ‘Gladbach have four, trailing City by three points before they meet in Germany on Nov. 23. Celtic have only an outside chance on two points. Atletico, beaten finalist in two of the past three seasons, are the only club with four wins. Antoine Griezmann’s stoppage time goal, adding to his acrobatic opener in the 28th, clinched a 2-1 win against Russian newcomers Rostov. Sardar Azmoun’s leveler in the 30th was the first goal conceded by Atletico goalkeeper Jan Oblak in this season’s competition. Bayern Munich forward Robert Lewandowski scored twice in a comeback 2-1 win in Eindhoven, where PSV led through defender Santiago Arias in the 14th. Lewandowski already struck a post and the crossbar with headers before he scored with a 34th-minute penalty. The Polish star finished off a cross by David Alaba in the 74th, and later had another shot hit the bar. Rostov and PSV have a point each, and Bayern have nine, trailing Atletico by three. Bayern host Atletico in the last game next month, and whoever finishes runner-up will likely be the most dangerous unseeded team in the round of 16 draw.